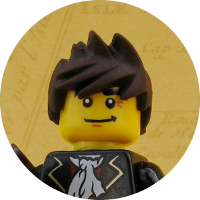 A Free-build for the Guilds of Historica and a continuation of the story of Adira Magdeburg. 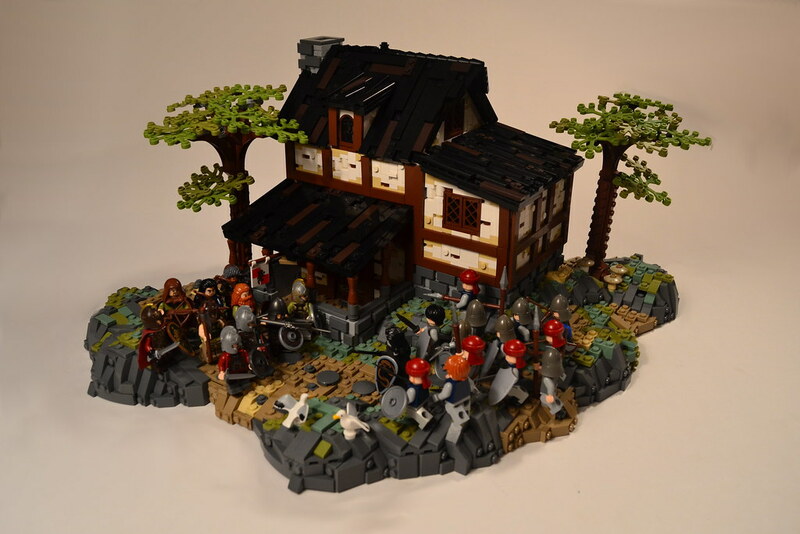 Please check here: http://www.eurobricks.com/forum/index.php?showtopic=113129#entry2291454 and the ones before it for back-story. 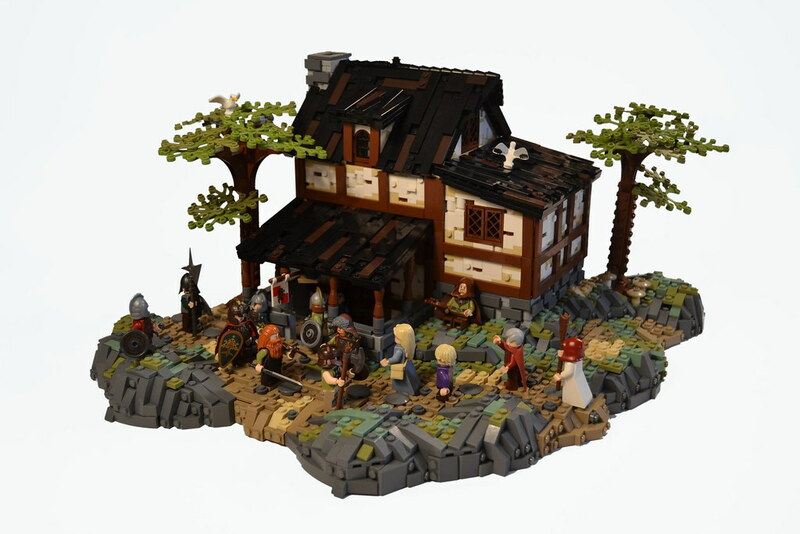 The sun's rays shone down upon Ravensbrook Tavern and Inn, their late summer heat competing with the mountain breezes over the group of refugees and make-shift soldiers congregating beneath their celestial battlefields. Cumulus clouds coasted over the mountainscape, their shadows crawling over the pinnacles and valleys. To Adira the bright atmosphere seemed almost obscene in light of the impending battle. The mood of the soldiers around her were equally annoying, as if they were expecting some kind of a party. They had been called from the field and outskirts of the town, and many did not yet fully comprehend the fact that their town was currently being overrun by Desert King troops. Those who did seemed to be in a state of disbelief, nervously making small talk with those around them. Only the refugees fleeing the town fully realized what doom overhung them. It was a pitiful trickle, most of the refugees probably fleeing into the mountains and finding their own way to the pass leading to the Nestlands. As it were most of those taking the highway were those who did not have the endurance to take a longer rout, and thus did not have the strength or prowess to fight. Adira glanced over the few dozen soldiers assembled. It would be enough to hold the road for a short while, but they would be done for as soon as the Desert King troops made the trip around their lines. The soldiers let out a cheer that echoed through the valley. At least what they lack in experience they make up for in patriotism, Adira thought. 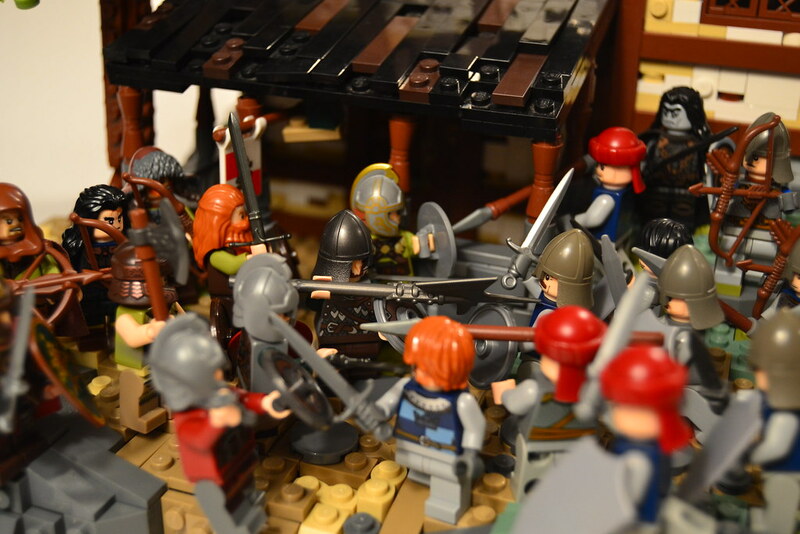 Quickly she ordered them into a shaky battle formation, those with shields in front, archers behind, and then took her place in the second row. Only after the soldiers had settled themselves into position did they hear the sound of marching feet on the road. The Desert King soldiers filled the roadway and overflowed it, trampling the crops on either side. 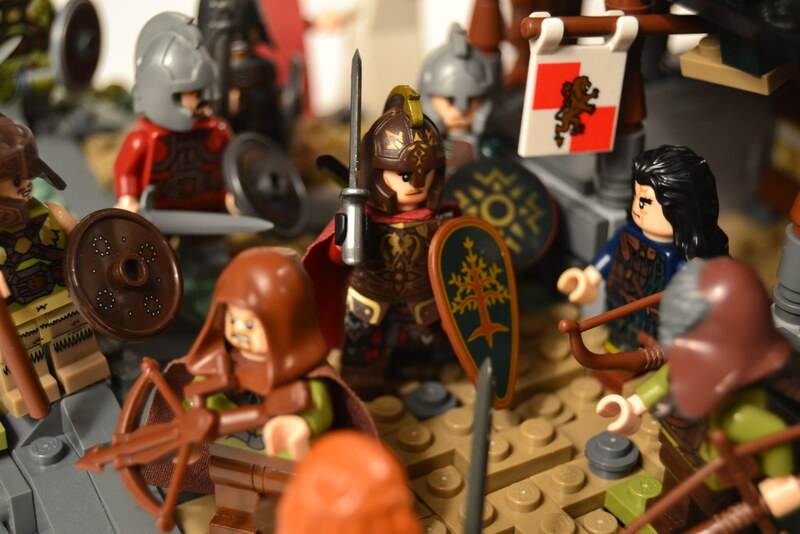 Their helmets glistened in the sunshine, and their blades flashed. It was even more then Adira had anticipated. The Desert King doesn't take any chances. Then their ranks parted, like a wave parting on a rock, and a black mailed man stepped out of their midst. Only he wasn't a man. Adira stared into the eyes of the same undead warrior who had attacked her outside of Queenscross, and had just recently helped to kill her friend and loyal soldier Udgr. Hate seared it's way into her mind, almost clouding it. Desperately she fought the urge to charge forward now and end this creature's life, once and for all. She knew it would destroy their chance to successfully defend the street, but suddenly the battle seemed to fade in significance. Then he saw her. His sword left his sheath, and rose above his head. For a long moment his eyes stared into hers, taunting her. 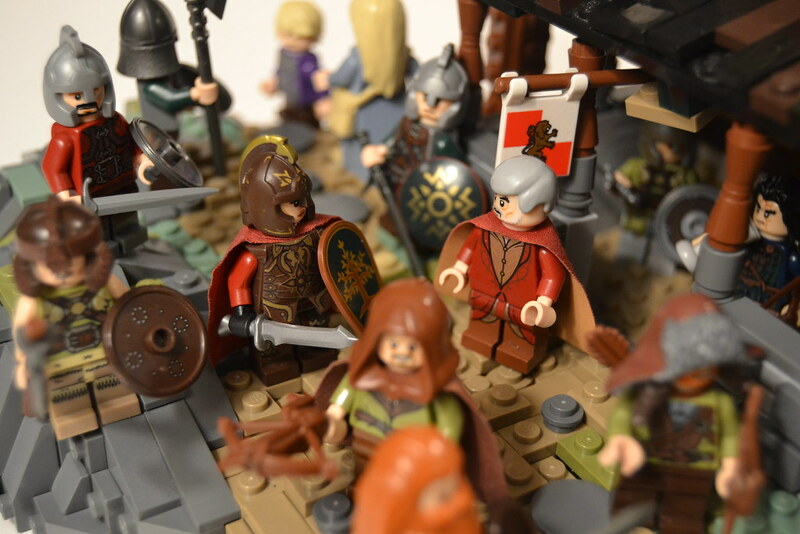 Then his sword fell and all hell broke loose. The surge of Desert King troops almost broke through the Estoladim ranks in it's first charge. The front soldiers faltered for a moment, but then with a war-cry from the Inn-keeper they regained their resolve, striking out ferociously into the Desert King horde. Adira moved toward the center of the road, trying to be visible and present for her men. A field commander of a trained army could afford to direct from the rear, but what the men of the mountains needed most was a leader who fought with them. Adira pushed her way into the front of the line and struck down a large spearman as he thrust toward a fallen towns-man. The smell of blood assailed her nostrils, and dust caked on the roof of her mouth. The striking of blades on shields crashed in around her, pierced by the cries of the fallen. Then and arrow whistled past her head, clattering off the shield of the man behind her. Then arrows were fallen all around her, clattering off armor, and sometimes striking home. The towns-men raised their shields above their head, and many were cut down by the advancing soldiers. Then a cry came from the back of their ranks as an archer pointed toward the back of the Inn then turned and started to run. Adira's heart sank. So they saw. They called our bluff. The line broke in chaos. 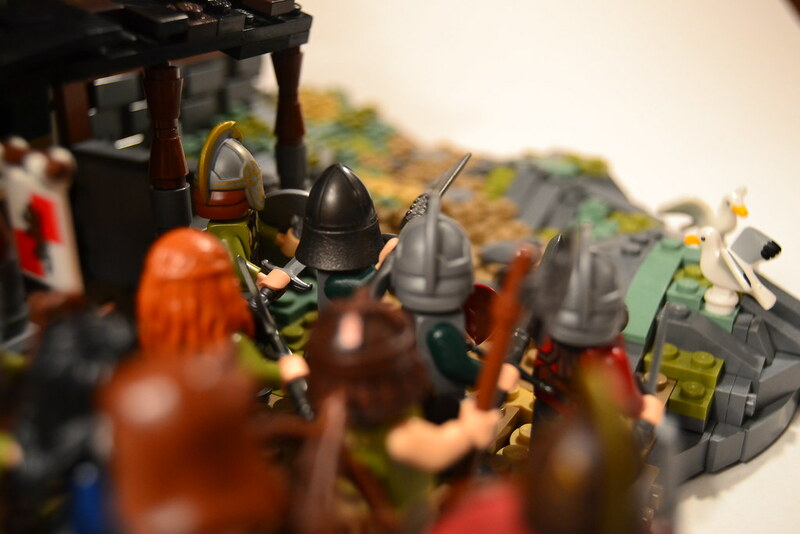 Men were throwing down their weapons and running, and the men standing next to them were being cut down from behind. 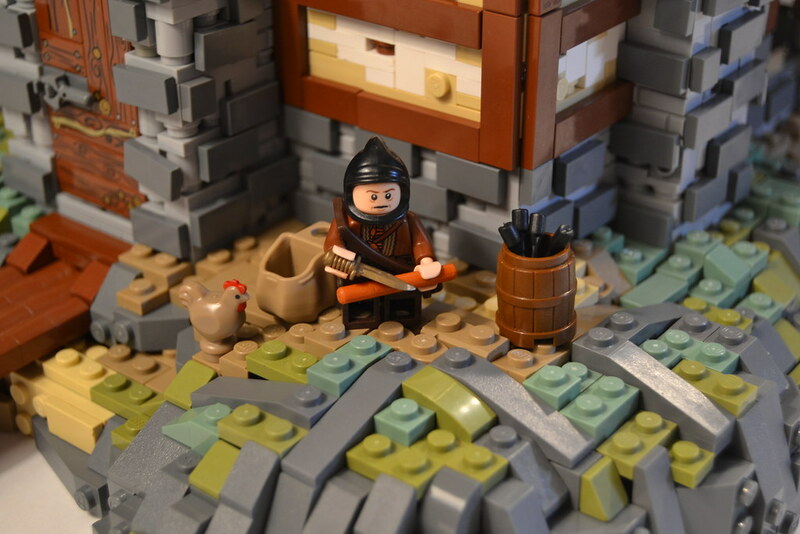 The inn-keeper bellowed his challenge at the entrance to his tavern only to be cut down from behind. It's over. The thought crossed Adira's mind but she refused to believe it. No, we can still rally! We can defend the road at a higher point, somewhere we can not be outflanked! But already she knew it could not be. There was no option left but to die here, by the blades of their oppressors, fighting for the freedom of Kaliphlin. A sword flew towards her. For a fraction of a moment she considered letting it hit it's mark. But then her sword was up, deflecting the blow. Now she was backing up and a voice, her own and yet not her own, was calling for a retreat. Her legs were carrying her back towards the mountains, along with her men. She would survive. But yet in her soul she was already dead. The build. 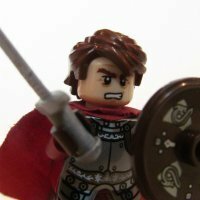 This build took me more then two months to complete (thus explaining my absence, hopefully), and required three Bricklink orders. Tudor houses are not a specialty of mine, and I had to redo the white-wash four times. The trees were a last minute add-on, and yes, I know they look horrible. The back. I was running out of pieces about now, so the landscape isn't quite as up to par as in the front, but I think it was worth it. I was originally intending to have water on this side (thus the dock), but didn't end up doing it (lack of pieces). The fletcher. Lame (and apparently deaf, if he didn't hear all the comotion on the other side of the Inn), he was called into service plying his trade for the town's archers. Probably still grumbling about how he can't be expected to make crossbow bolts without any experience. The Inn's one remaining dairy cow. They used to have many, but all the others were used up in the siege. This one probably won't survive the siege either, unless some remaining peasant decides to, uh, liberate it from the desert King troops. And I guess that's it! Thank you all for your patience, and comments! Aidar, that's the best build i've ever seen! I just love it! Very nice build as always Adair, I really like your irregular borders and great work with the house as well! I know what you mean about running out of landscape pieces... 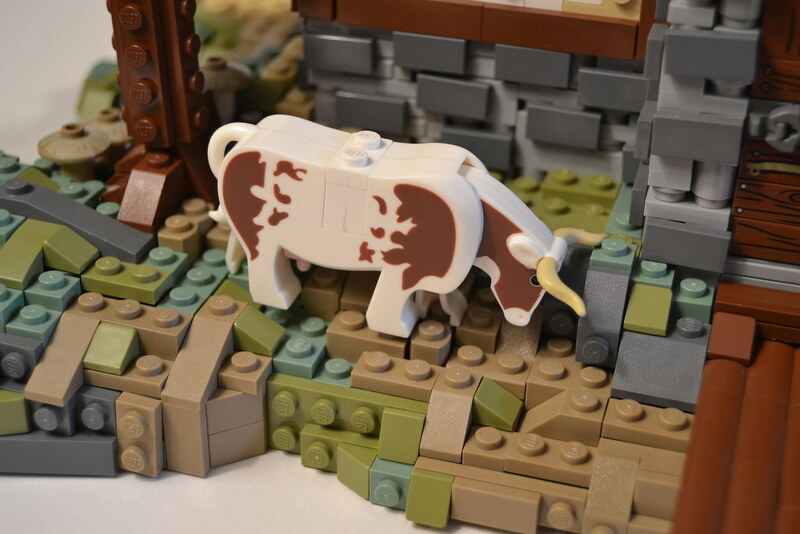 I often think that you can tell which part of an MOC I built first just because the landscape in that section looks better! This is a outstanding build I really like the layout of the building, and color choices. The only change I might suggest, would be to raise the chimney another brick or two. 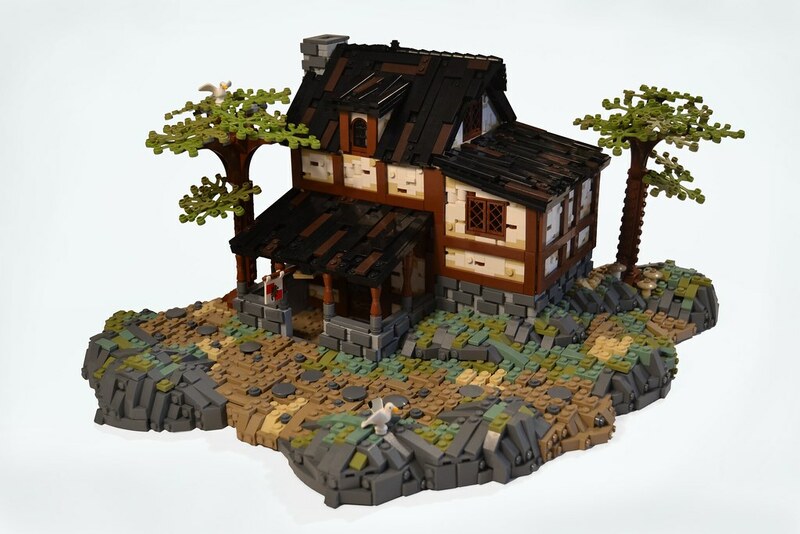 Beautiful build- that house is great! The landscape is great, and that is a well-executed design for a half-timber house! The build would look interesting with water in back, but I understand if you did not have the pieces. The house looks great even without the water! The roof, stone wall portion, and door are also all well done! Your color blending is excellent as always. Beautiful house as well. Exactly! That's actually why I added the lighter tan (though I like it now). Thank you very much, Isaac! Very glad you liked it! Yeah, the Chimney probably could have been higher... thanks for that critique! Thank you, Slegengr! Yeah, I'm going to try to stock up on water pieces for next time. I love the tavern! It reminds me of wandering around the wilderness in Oblivion (ES). Tavern and landscape look amazing! 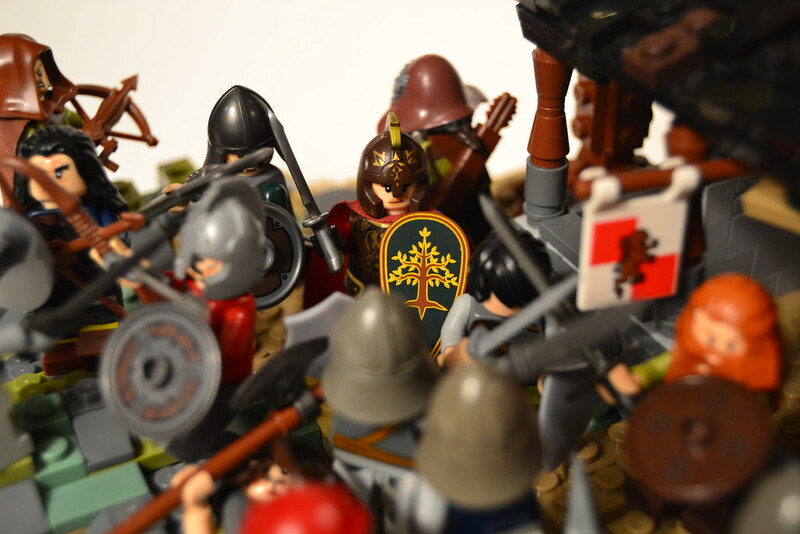 The minifigs are also very nicely placed, battle looks lively! Thank you! I've played that game, it's pretty awesome. Thank you, Puvel! Glad you like it! I think that the trees are quite appropriate for where they are, by a tavern on a major road. It is obvious to me that the people would keep those trees manicured. The story is engaging, if disheartening for the resistance movement. Has the visitation of Minister Prndrn been pushed back in the story? This build looks even better in the GoH setting! Great continuation of the story, I'm looking forward to more! Great structure, great landscaping, great battle posing with the figs, great photography. Thank you, Gedren! Actually, I was planning to have that take place in the Nestlands, so it will come directly after my next build. :) Remember that this took place about two months ago. Thank you, Milo! Glad you like it! Wow, really long comment this time! Or maybe it just has more dots... :P Thanks Andrew! Nicely done with the building. I really like the landscaping and the rock work. Thank you, Sarah! Very glad you like it! As always an impressive build, Adair - you are really mastering this low key, dramatic colourscheme, which makes your builds immediately recogniseable! 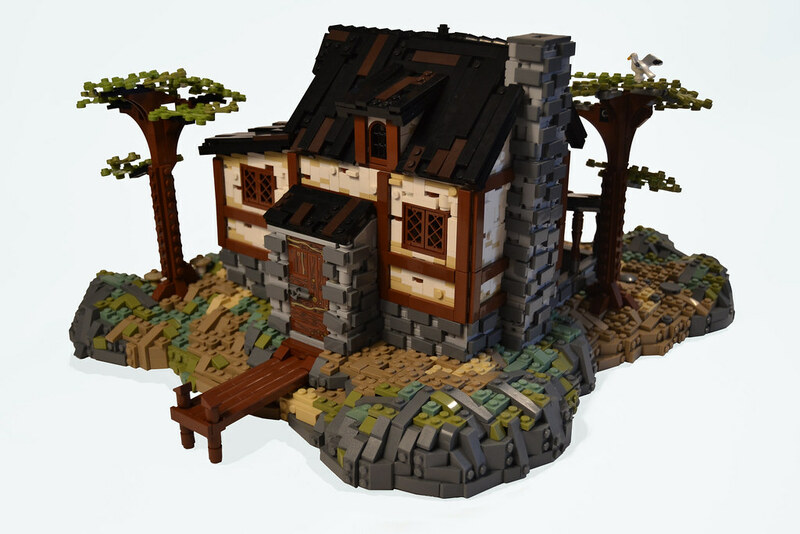 For this brilliant build, I have only one comment: I am not sure about the door with the printed tiles. With everything having brickbuilt texture, it looks somewhat out of place. The second part of that comment is by far the more encouraging one, which is saying something. Thanks a ton, Bregir! Oh, and I think the door problem can now be remedied in later builds, do to a new piece surplus of mine. Thanks for the suggestion! Thank you, Robin! Very glad you like it! And yes, I would suggest that technique. Awesome build Adair! That landscape is just fantastic and the house also looks great! My only criticism is that some of the pictures are very dark, in particular the 5th one down. Did I say that this is a great build!